SAMSUNG Galaxy S7 Edge. It will sticks to the curve area. You are request to align stick properly. Screen Protector features Improper application may cause air bubble trap underneath. Crystal clear film. The video will instruct you on how to successfully install your screen protector to your device. Compatible with Samsung Galaxy S8 plus/ Galaxy S8 2017 Smart phone. 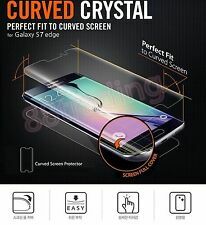 Easy to install: PULESEN Samsung Galaxy S8 Plus Screen Protector wet application ensures super easy, bubble free, error-proof, anti fingerprint and scratch proof installation that will leave our film perfectly contoured. Samsung Galaxy S7 Edge. It will sticks to the curve area. You are request to align stick properly. Quantity: 5 x front LCD screen protector (3-layer) 5 x back cover protector (3-layer). (5 sets) Ultimate Full Size Premium Front Back Screen Protector for. Official Store - Anti Bubble - Free Next Day Delivery! This is NOT a glass made protector, due to the curve edge of the phone, item is made of high impact absorb soft material, uldiva clear Shock-resistant layer under the protector, high touch sensitivity. SAMAR SMOOTH FEEL: Premium Quality feels far smoother than any normal other PET Screen Protectors. Fingers slide across the Phone LCD as freely as without any Screen Protectors. Premium Quality PET Screen Protector for Samsung Galaxy S7 EDGE. 6x Savvies® SU75 Screen Protector for Samsung Galaxy S7 Edge (Front Back). Savvies UltraClear Screen Protector for Samsung Galaxy S7 Edge (Front Back): Crystal-Clear, easy application, excellent price quality ratio. 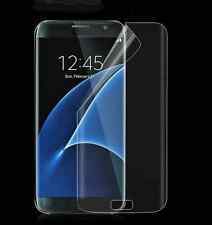 Premium Curved Film Screen Protector for Samsung Galaxy S7 EDGE. This screen protector is designed to wrap around the phone, covering the whole screen of the S7 Edge. If you want premium protection for the delicate screen on your S7 Edge, covering the whole screen look no further than the Premium Curved Protector. Screen protector film does not interfere with touch screen usability. 99% UV Protection The screen protector can reduce eye strain caused by the LCD screen. The screen protector used for your device quickly and easily adheres directly to your screen. Samsung Galaxy S7 Edge. So strong enough to prevent scratches, scratches and rupture. Precise laser cutting size provides maximum protection for the entire touchscreen surface of your Samsung Galaxy S7 Edge. 【NOTICE】: Watching the INSTALLATION VIDEO is the key to your success. Compatible with Samsung Galaxy S7 2016 Smartphone. 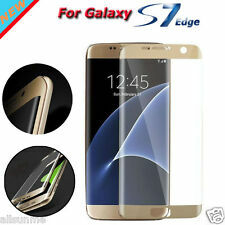 HD ULTRA CLEAR - Optically transparent, Ultra slim thickness, virtually invisible and HD clear screen protector. For S7 Size:13x6cm. For S7 Edge Size: 14x5.8cm. -High quality PET film for matte surface. Use the clean cloth or finger to remove any visible bubbles from the screen. Peel the protector layer off the adhesive side. Step 4: Hold the edges of the screen protector, align it to the screen and apply gently (avoid touching the adhesive). Increase the protection of your screen from dust and scratches with our thin screen protectors (thinner than tempered glass). Attach screen protectors without bubbles of air - protectionfilms24 - YouTube. Privacy Protection. Privacy protection starts at a 30° angle. Paste link into a browser window:[isdntekvideo]. The multitouch optimized surface preserves the original touch experience of your device. 2x BROTECT® Matte Screen Protector for Samsung Galaxy S7 Edge. BROTECT® Matte Screen Protector for Samsung Galaxy S7 Edge- Matte and anti-glare, anti-scratch, anti-fingerprint, easy to apply and residue-free removable. 18x Savvies® SU75 Screen Protector for Samsung Galaxy S7 Edge. Savvies UltraClear Screen Protector for Samsung Galaxy S7 Edge: Crystal-Clear, easy application, excellent price quality ratio. The Savvies® SU75 UltraClear screen protectors are manufactured in Germany with the latest high-precision laser machinery. Attach screen protectors without bubbles of air - protectionfilms24 - YouTube. Matte and Anti-Glare. The matte surface reduces light and sun reflections on your screen. The multitouch optimized surface preserves the original touch experience of your device. Spigen Screen Protector for Samsung Galaxy S7 Edge. : Curved Crystal. Engineered Curved Edges. Compatible Model No. : Samsung Galaxy S7 Edge. When you receive the item. We will do our best to resolve problems, if any. 2x BROTECT® HD-Clear Screen Protector for Samsung Galaxy S7 Edge (Cam on the back). BROTECT® HD-Clear Screen Protector for Samsung Galaxy S7 Edge (Cam on the back)- Crystal-clear, hard-coated, anti-fingerprint, easily mountable and removable. Why risk becoming infected?. Did you know that your device is a source of bacterial infection?. Attach screen protectors without bubbles of air - protectionfilms24 - YouTube. Matte and Anti-Glare. Your device may look clean but germs are transferred daily to displays, causing them to carry more bacteria than an average toilet seat. Soft Nano Film, but not glass, will not shatter, be stronger and durable than tempered glass screen protector. Compatible with: For Samsung Galaxy S7 Edge. Material: Nano Explosion-Proof PET Film imported from Japan. Why risk becoming infected?. Did you know that your device is a source of bacterial infection?. Attach screen protectors without bubbles of air - protectionfilms24 - YouTube. Your device may look clean but germs are transferred daily to displays, causing them to carry more bacteria than an average toilet seat. 6x Savvies® SU75 Screen Protector for Samsung Galaxy S7 Edge. Savvies UltraClear Screen Protector for Samsung Galaxy S7 Edge: Crystal-Clear, easy application, excellent price quality ratio. The Savvies® SU75 UltraClear screen protectors are manufactured in Germany with the latest high-precision laser machinery. The 94% light penetration preserves display clarity and sharpness. Attach screen protectors without bubbles of air - protectionfilms24 - YouTube. The multitouch optimized surface preserves the original touch experience of your device. GENUINE ZAGG Invisible Shield HD Dry Screen Protector. The InvisibleShield HD® is created from a film exclusive to ZAGG, and with thousands of original designs, the InvisibleShield is the perfect choice for protecting any device. 2x BROTECT® HD-Clear Screen Protector for Samsung Galaxy S7 Edge. BROTECT® HD-Clear Screen Protector for Samsung Galaxy S7 Edge- Crystal-clear, hard-coated, anti-fingerprint, easily mountable and removable. 6x Savvies® SU75 Screen Protector for Samsung Galaxy S7 Edge (Cam on the back). Savvies UltraClear Screen Protector for Samsung Galaxy S7 Edge (Cam on the back): Crystal-Clear, easy application, excellent price quality ratio. Compatible Model Galaxy S7 Edge. 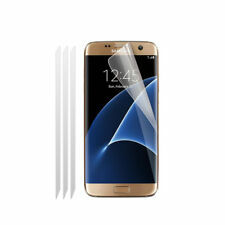 Screen Protector Feature 3D Front Full Protective, High Definition. Screen Protector Material PET. 2x BROTECT® Matte Screen Protector for Samsung Galaxy S7 Edge (Back). 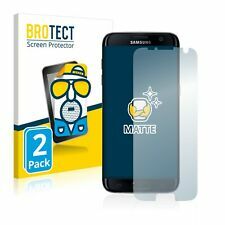 BROTECT® Matte Screen Protector for Samsung Galaxy S7 Edge (Back)- Matte and anti-glare, anti-scratch, anti-fingerprint, easy to apply and residue-free removable. 6x Savvies® SU75 Screen Protector for Samsung Galaxy S7 Edge (Back). Savvies UltraClear Screen Protector for Samsung Galaxy S7 Edge (Back): Crystal-Clear, easy application, excellent price quality ratio. Vendor: Zagg. Samsung Galaxy S7 Edge. Dry Application - dry application makes applying your Invisible Shield simple and accurate. Product Gross Weight (kg): 0.060. InvisibleShield HD Dry. Colour: Clear. Vikuiti™ screen protector ADQC27 for Samsung Galaxy S7 Edge: Crystal-clear and anti-reflective, hard-coated, dirt-repellent, very simple assembly, residue-free removal. Our Vikuiti™ screen protectors are cut by laser in Germany on state-of-the-art machinery. Enjoy with our crystallineSuperClear Film screen protector Samsung Galaxy S7 Edge absolute colors fidelity and optics. extra thin and easy to apply Mikvonfilm screen protector SuperClear Samsung Galaxy S7 Edge. 6 x Mikvon films screen protector SuperClearfor. Fingerprints and dirt can be removes easily from the film screen protector Mikvon SuperClear for Samsung Galaxy S7 Edge. Mikvon SuperClear -. extra thin and easy to apply Mikvonfilm screen protector SuperClear Samsung Galaxy S7 Edge. 1 X ENKAY PET Clear Film For Samsung Galaxy S7 Edge. Compatible With: Samsung Galaxy S7 Edge. 1 X ENKAY PET Clear Film For Samsung Galaxy S7 Edge. Compatible With: Samsung Galaxy S7 Edge. Net Weight: 4.00g. Material: PET. Moulded Screen Guard Protector in Clear for the Samsung Galaxy S7 Edge XSCPE-SAMGS7ED by Beyond. - Moulded Sides to fit perfectly on Galaxy S7 Edge. Professional & Cool. the greatest Screen Guard for LCD Screens.